Economical to Use. Dilutes to Strength Needed for Job. Dissolves even hardened grease and oil deposits instantly. 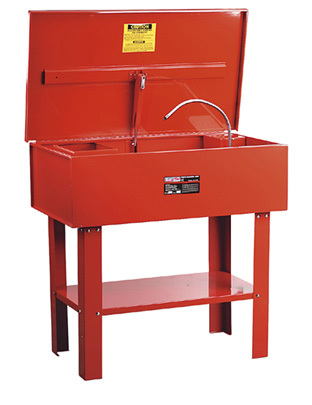 Cuts through accumulated sludge on machinery metal parts…dissolves dirt, soot, grease and grime deposits on road equipment…makes short work of hardened grease and oil deposits on concrete floors. Dilute it. So super concentrated, a 1 to 10 ratio can tackle the toughest jobs. Use a 1 to 20 ratio for most daily maintenance tasks. Replaces mineral spirits with no disposal problems. Non-flammable for safer storage. Non-polluting and biodegradable for safer disposal in sanitation systems. Rust inhibited for safe use on ferrous substances. Do not use with aluminum. Dilution is directly dependent on temperature soil severity, and cleaning conditions. At room temperature, dilute 1:8. For optimum cleanings heat to 120°F and dilute 1:15. Steel parts cleaned with “GREASE-OFF 150” are protected with a water-soluble rust inhibitive film, and should not be rinsed following cleaning. Dilute 1:10 when using as sump cleaner in machine sumps; circulate as necessary, drain and rinse.